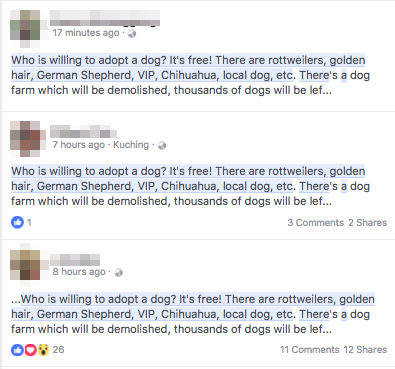 A fake message asking people to adopt dogs for free has gone viral on social media. A screenshot of the message that has been circulating online. The message goes like this: "Who is willing to adopt a dog? It's free! There are rottweilers, golden hair, German Shepherd, VIP, Chihuahua, local dog, etc. There's a dog farm which will be demolished, thousands of dogs will be left stranded. If no adoption, they will starve to death. Next month on the 28th is the due date, if you cannot adopt, forward this message to save these poor dogs, but if you wanna adopt, please contact Ms. Liu ‭+6012 905 XXXX. Your copy and paste will save the lives of countless dogs!" A lot of people, especially dog lovers, took notice of the message and kept forwarding and sharing it so that the public are aware that they could adopt the dogs, free of charge. 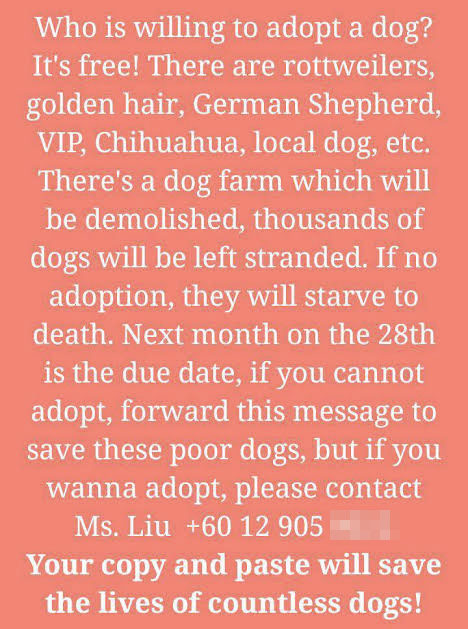 If people call the number in the message, they would realise that there are no dogs up for adoption and the phone number does not belong to a "Ms Liu" — it belongs to a woman named Li Ling, who is based in Kuala Lumpur. It was pointed out that the message contained several telltale signs that it may be fake, which many may have overlooked, including the lack of information about the "dog farm" and the generic deadline of "next month on the 28th". Li Ling, the owner of the phone number stated in the message, reached out to SAYS recently and shared about how the hoax has severely affected her life since she began receiving calls on 12 October. 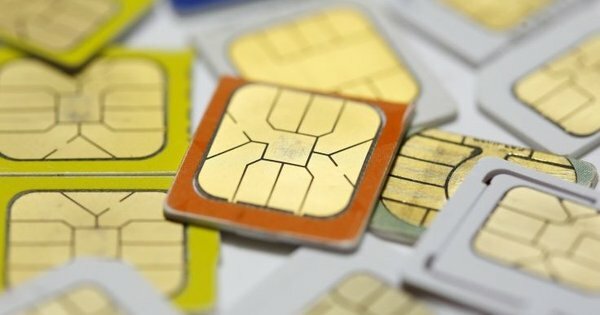 She revealed that the calls died down after a week, but the viral message resurfaced again recently. 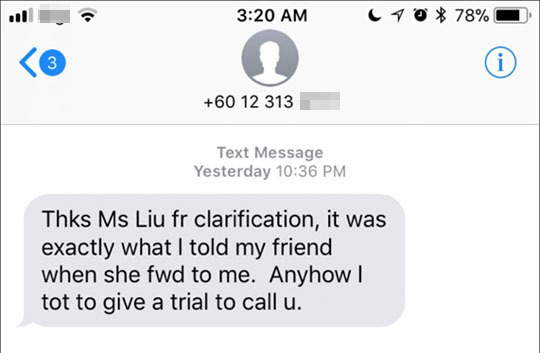 While most people do not have ill intentions in forwarding the message, what they do not realise is that Li Ling has to deal with the unsolicited enquiries and harassment due to the overwhelming response from members of the public. "I received calls and messages every minute, from dog lovers all over Malaysia (Penang, Kuching, Johor, Kulai, Klang etc)," she said in an email written to SAYS. Li Ling has even received enquiries from Australian numbers. "I replied to every single call informing them that it is a hoax and asking them to stop spreading further. However, it doesn't seem to work as people just forward without verifying the message that they received," she said. It was learned that she has been using the phone number for at least 10 years now and it definitely has sentimental values to her. Unfortunately, it looks she would have to forgo using the same number as the hoax message is likely to continue to circulate. A few other Malaysians have became victims of the same fake message that has been making it rounds online, based on reports by The Star and Rojak Pot, a Malaysian portal passionate about finding and debunking rumours and myths. It was learned that at least one of them had lodged a police report over the matter. 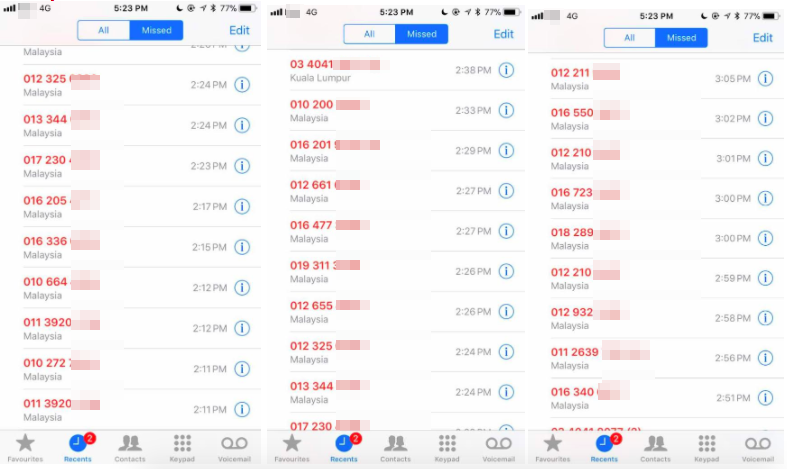 Based on a report by Sin Chew Daily, the message was reportedly circulated to prey on unsuspecting dog lovers and bait them to call the number included in the message, which belongs to the scammer. Somehow, this fake message has been distorted and some people have become a hoax victim as their telephone numbers were included in the message. This could happen to anyone. If you see people sharing the message, do let them know that it is fake. You could be helping out a victim of hoax. 31-year-old Leigh Aiple underwent two marathon surgeries in the space of five days. Ruxyn spends too much time guessing a stranger's personality based on the MBTI. A hoarder who enjoys crime and thriller movies.